She tells me this is where Faith comes in. If God had limited patience instead of limiteless patience, I would have worn Him out yesterday. It was a hand wringing day. And I know better. I am surrounded by nativity scenes. Hemmed in by mangers. One to my left, one to my right and one behind my doubting Thomas head. The Trinity symbolized I see now, by my three scenes of His birth. And I still wring the hands though He wrought a life of pain and sacrifice for me. And even with the physical reminders of my Savior I still need to be told….and this is where Faith comes in. She knows my deep struggle. She is what I needed God to bring my way months ago as my struggle as a parent of a child who learns like we all do, uniquely. Who is wired like we all are, by Father God, individually, with strengths and gifts. Who is growing, as we all are on this journey, at his pace marked by his beautifully and wonderfully made intricacies. But a mother wrings her hands and a heart has been know to skip a beat or double up on beats. And she has come along to hold my hand in the dark nights of the soul. And there is another too. Who writes a beautiful letter. He is patient and strong and godly. And he tells me things that make me cry, too busy in my doubt and worry to see on my own. Too close and too doubled over in confusion to see or own or know, truly. Words of confidence and hope. Words of affirmation and decisiveness. The two come along side and bolster my spirits and I know they are life savers wearing flesh and blood and bones to a mother of waning faith. And at the end of the night, when the black curtain pulls over a day marked with fatigue and anxiety she speaks into my soul. Words I don’t read until His new mercy morning arrives. And she write these words “He is a great kid…we just all need to help him learn how to access his strengths and use them…it will come with time, patience, and persistence! HAVE FAITH! And like the perfect storms of life, she is talking and texting and emailing me with a diligence and committment to shoring up my child’s struggles with a tender and firm spirit. And the calm before the storm comes in fact after the storm has passed. She knows the language which sounds like Greek to my ears of misunderstanding and misinterpretation. I am learning daily the language of ADHD. And it is Russian and Chinese and Hebrew all rolled into one. I need a translator. I need help. It comes in the form of co-pilgrims and co-laborers. I wrote a letter yesterday to my church which was hard to explain to a questioning child. She looks on me with doubt and lack of understanding. I tell her, if you read my letter you will understand why I feel lead to step back for a season from serving.Because I know in the letter I have said I feel like this is an act of obedience. And there is confusion and fatigue from schism and division and I need a season of quiet and contemplation and prayer and clarity. A pause in my serving to steady a wobbly spirit. But I can see I have let her down. She worries that it means we are leaving the church. We are not. I am taking a pause in my service in several different capacities. And the quiet sets in. And the last thing I want to do is disappoint a child. But she is questioning and maybe confused. And who can read a sixteen year old girl’s mind. So I look at the managers that hem me in. There are three. Some days I need one hundred and three. Days like my yesterday. I thank Him for His new Mercies, for the rain and for tears. My husband walked in from Fishermen men’s ministry, last night. Our friend spoke. He has months to live. He has cancer. And when you have been in the midst of one so full of faith and full of life you radiate the Glory and the Hope that come beaming from the face of a man at perfect peace. From our friend Pete. You bring all that home with you from a night in the presence of living, breathing, Hope. He tells me pieces of stories that Pete told the men. Some of it I grabbed and some of it my weary hand wringing self let fall to the ground. A weary soul doesn’t hold tight to Hope. But you long to brush up against Hope like this and pray that the remnants and particules like dust fall on you and stay. Fall on a weary dusty soul. Dirty with doubt. And I pray my daughter can wrap understanding around my walking away for a season of pause. That I didn’t throw in the towel , its only in the wash for a season of renewal. And to gain clarity of mind and heart and spirit. That in obedience to Him He will give me a language of love to explain to her rightly my decision. Just like the language of understanding I need to learn to speak with my son in his struggles that are uniquely his own. Its raining outside, the day weeps as I weep. And I think that today I will play as I did when I was a child. With the manager scene. Didn’t we all. Move the pieces around and marvel. Look on the Mary and Joseph and the animals and the moveable baby Jesus. I think I’ll move in a little closer to the manager today and the baby who bears the weight of the world and the weight of my sin. And today, the weight of a mother’s pain as she seeks an increase in faith. This rainy December day, I know anew, His mercies are new everyday. And that I can proclaim Alleluia Anyway. Linking with Emily, Jennifer, and Duane today. Joining Joy at joy in this journey dot com for Life Unmasked. I love how you reminded us that it’s not just the weight of our sin, but the weight of our pain. Brenna, am wrapping my embrace around your words here. Thanking you for being a present sister…gift. So much on your plate, friend, yet still, you lean in close, writing through it all. I am in awe. You are in my closest prayers that this time of stepping away so that you can step in closer will reap a whirlwind of peace and grace. Thank you, you soothe a sister’s soul. Ah yes the peace and grace, I see glimpses. Thanking you for those closest prayers of yours. Gift. 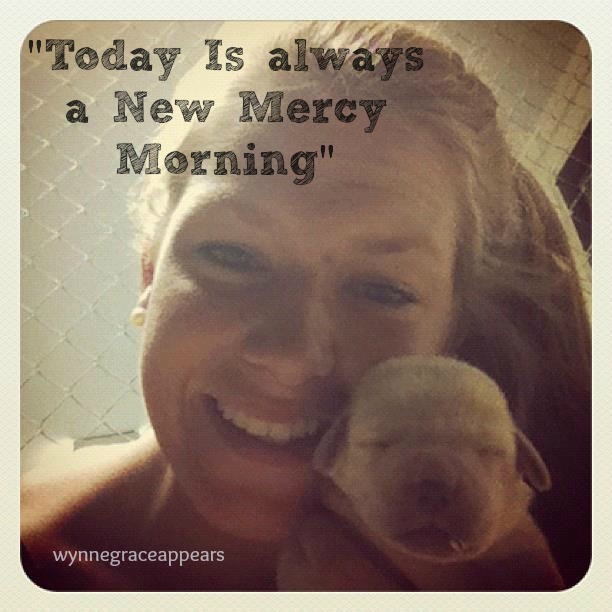 “Today is always a new mercy morning.” Oh, Amen! You wove a beautiful post of questions and answers, doubt and hope, quiet and storms, reaching out and reaching deep within. When our children struggle, I think it is doubly hard on us as moms. I know I want to just fix it all for them – but that is not the way. The Lord has unique lessons to teach them, and some of those lessons come from dealing with an anxious mom…with lessons still to learn herself. Have a blessed new mercy day! Maureen, I am holding on to your wise words here, they penetrate the soft places. Yes, remove the desire to fix from me Lord….in your mercy. I am listening to the lessons with your encouragement. Move closer to the manger, Elizabeth. Don’t feel guilty for this time of rest and refueling and serving in many other ways. Your family and the situations you’ve described are in my prayers today! Oh sweet friend, your words wash over me and they bring calm to my spirit. Thanking the Lord for friends in this sweet community. Grateful you are bending your heart my way in prayer. Look forward to more wisdom from you as I go visiting later today at Em’s place. Finding new mercies each morning from a God with limitless patience for our frail flesh. I am reminded that all we need to move mountains is faith the size of a mustard seed. That’s just a little bit. And it’s enough. I so appreciate your honesty and vulnerability here, friend. My mama’s heart hears yours. And my overworked (by the church sometimes) self says, Step away friend. As deep calls to deep, so is God calling to you. He is holding you and keeping you and giving you what you need afresh each day, and you are listening in the quiet, the coming close to the manger. You are doing the good hard things, and you are bearing good fruit and letting us see it. It might be different fruit than you’d expect or want, but it is lovely fruit. Sending love and lifting up prayers for you right now. Thank you friend for being here and for your encouraging voice. Im holding on to your kindness and squeezing it tight. Grateful you were here and left the fragrant scent of grace. those friends who walk alongside are the hand of God. blessings to you in this hard season.